Deep State Investigation Morphs Until They Find Something! | What Did You Say? The Department of Justice was created by the Judiciary Act of 1789, but I suspect the authors would stroke out if they could see the malfeasance in the department now. Oh, not everyone. The jury’s still out on Jeff Sessions, an honorable man who may be a bit too feckless to perform his job really well. That whole “equal and impartial” thingy seems to have been lost on people like Special Counsel Robert Mueller and Deputy Attorney General Rod Rosenstein. …Rosenstein assigned Mueller to conduct a counterintelligence investigation, which is not a sound basis for appointing a special counsel; the regulations require grounds for a criminal investigation. We now have a redacted version of the deputy attorney general’s guidance to the special counsel. 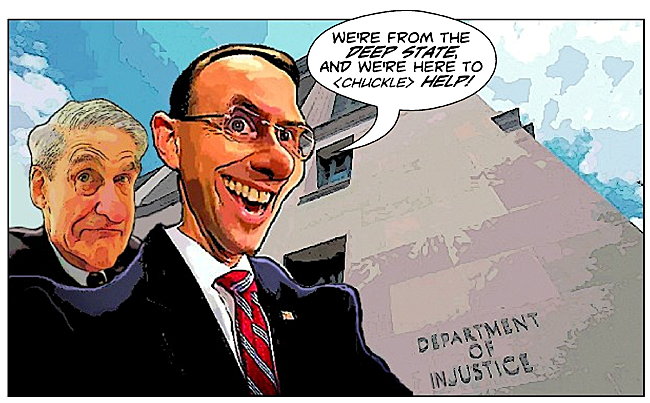 Eight months ago, in August 2017, Deputy Attorney General Rod Rosenstein secretly gave Special Counsel Robert Mueller specific guidance as to the crimes Mueller is authorized to investigate. The guidance came about ten weeks after Mueller’s May 17 appointment. This guidance purports to describe the grounds for criminal investigations, marking the limits of the special counsel’s jurisdiction. We learned Tuesday morning, based on a Monday-night court filing by Mueller, that Rosenstein’s amplification of Mueller’s jurisdiction was set forth in a classified memorandum dated August 2, 2017. To wit, Rosenstein defined the probe as “the investigation confirmed by then-FBI Director James B. Comey in testimony before the House Permanent Select Committee on Intelligence on March 20, 2017.” In that testimony, Comey had quite explicitly confirmed a counterintelligence probe: “I have been authorized by the Department of Justice to confirm that the FBI, as part of our counterintelligence mission, is investigating the Russian government’s efforts to interfere in the 2016 presidential election” (emphasis added). Now somehow the James Comey confirmed, Deputy AG Rosenstein directed, investigation carried out by Special Counsel Mueller has evolved as each rabbit trail fails to yield the desired results. Those results being the takedown of President Donald J. Trump. The Russian Collusion theory was touted as a sure thing. Until it wasn’t. And since all of the possible collusion pointed to Russia with Hillary and Bubba Clinton and their nefarious, money laundering racket (AKA The Clinton Foundation), Mueller et al quickly pivoted to other, seamier goals. Sure looks like the end game is find something, ANYTHING to bring POTUS down! Seems to me it should be the Deep State punted out instead.